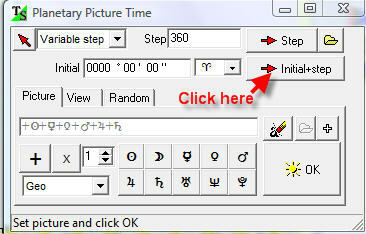 The idea of Planetary Picture Time (PPT) is very simple. 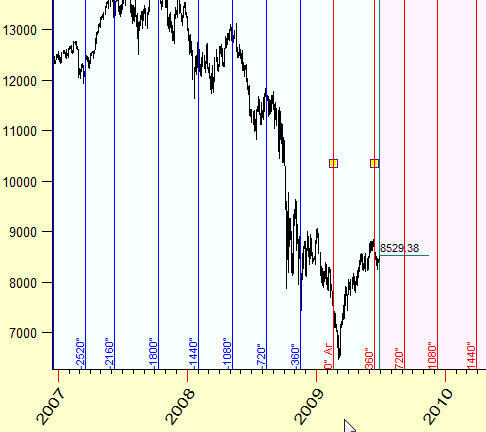 We construct the synthetic planet (which is called "a planetary picture") and try to forecast the stock market events using the coordinates of this synthetic planet. As an example we can consider this planetary picture the Sun+Mercury-Venus. It means that geocentric coordinates of this "planet" are calculated as geo longitude of the Sun plus longitude of Mercury minus longitude of Venus. 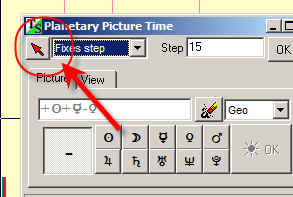 To run PPT module follow "Advanced"->"Planetary Picture Time". You will see the bunch of vertical stripes. 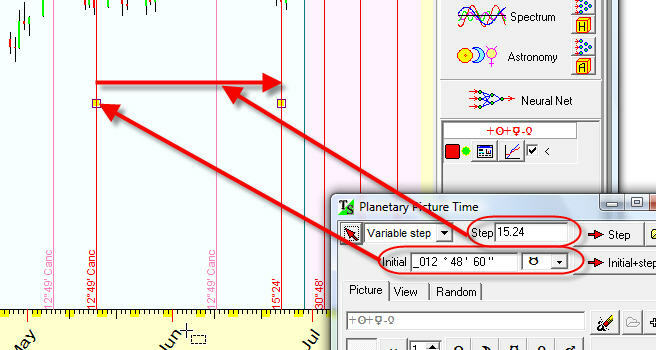 The first (point A) vertical stripe is our initial point; here the program indicates that the coordinate of Sun+Mercury-Venus point is 25degrees 49 minutes of Pisces. The second stripe (point B) shows the angle separation between A and B points, I set it to 45 degrees. It means that the longitude of our synthetic planet is increased on 45 degrees. 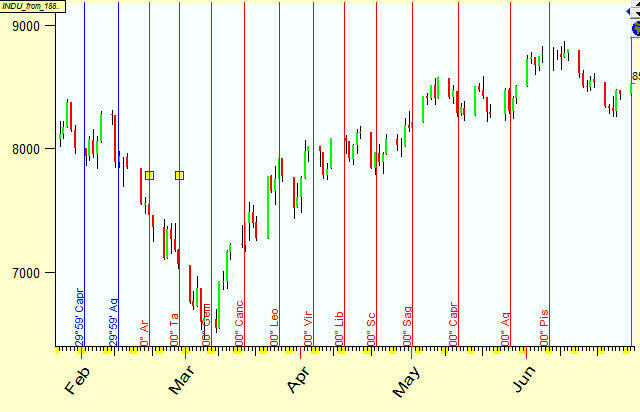 Next vertical stripe corresponds to 90 degrees increment (2x45); the next is 135 degrees (3x45). 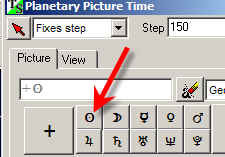 The program will display the longitude of our planetary picture together with the price chart. 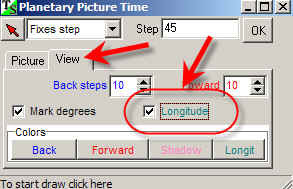 As you see, in the end of January 2008 the longitude has been the same as for our anchor data, March, 17 2008. It was caused by retrograde motion of one of the planets involved (Mercury in our case). 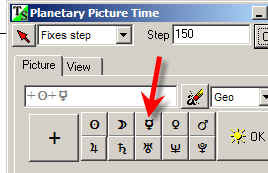 Example #1: We want to display the moments when Sun+Mercury+Venus+Mars+Jupiter+Saturn picture ingresses the first degree of Aries. Example #2: We want to display the moments when Sun+Mercury+Venus+Mars+Jupiter+Saturn picture ingresses the first degrees of Aries, Taurus, Gemini .. .Pisces. 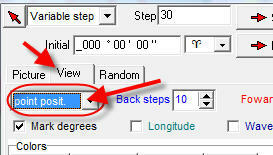 The same manner you can calculate 15, 10, 5 degrees or any other steps. 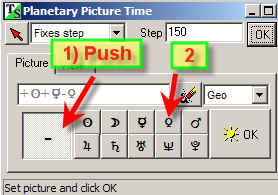 Example #3: We want to display the moments when Sun+Mercury+Venus planetary picture has the same longitude as Mars+Jupiter+Saturn picture.